If you are planning on getting an Amazon Kindle Fire, wait till next week for a more advanced tablet (from Google I/O) wait till next month. According to a post on CNET on Monday, a “credible source” said that Amazon is planning on releasing their second generation Kindle Fire next month. The new Amazon Kindle Fire is said to have a 7 inch screen with some hardware upgrades like hardware volume controls and front and rear cameras, which have been common complaints from Amazon Kindle Fire users. It is very likely that Amazon will also improve performance and update on the design of the next generation device. Sources also says Amazon plans are maintaining the same price on the next generation Kindle Fire at $199. Like the current generation Kindle Fire, the next generation Amazon Kindle Fire will deeply depend on Amazon’s cloud and online services. E-Books will come from Amazon’s Kindle store, videos will come from Amazon’s Video service, and apps will come from Amazon’s own Android app store. 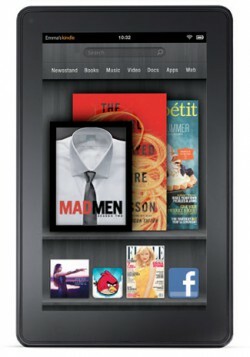 In the past months, rumors have been circulating about a new version of the Amazon’s Kindle Fire. Digitimes has recently reported that Amazon is considering a new Kindle Fire, with a $199 1,280-by-800-pixel 7 inch tablet and to be launched in the beginning of the third quarter of 2012. They also reported during the month of May that Amazon is planning on launching a 10.1 inch Kindle Fire around the same time. Although their past track record is spotty in rumors. As of right now, regular black and white e-ink Kindle sales are slipping while Kindle Fire sales are climbing. Also, reports are saying that Google is planning on releasing their own tablet that will be under the $200 price tag and run the next generation Google Android Software, dubbed Android Jelly Bean (version 4.1). We will know more about Google’s tablet during Google I/O.